Grad school is tough enough. Caryn Roach is doing it with grace. And cancer. “It was the third day of school and I was in class, touching my neck,” recalls Caryn Roach, a student in the USC Division of Occupational Science and Occupational Therapy’s entry-level professional program. “And I felt a big lump.” With one touch, what was just another day in the life of a Trojan graduate student suddenly became something much more. When you’re a 30-something student enrolled in the nation’s top-ranked occupational therapy graduate educational program with a bright career ahead of you in a workforce market booming with employer demand, “lump” is the last word you expect to hear, let alone feel. But as a budding occupational therapist, Roach is naturally attuned to the ways health conditions can variously impact everyday activities and lifestyle. Rather than shrug off those first suspicions, as she might have when she was working in the real estate industry prior to coming to USC, red flags were raised immediately. After class was dismissed, Roach walked to the Eric Cohen Student Health Center in the August afternoon to begin a diagnostic workup. After being referred to radiology for further testing, less than two weeks after feeling that fateful lump Roach received her diagnosis: Hodgkin’s lymphoma. At the USC Health Sciences Campus occupational therapy classes convene in the Center for Health Professions, a building literally across the street from the USC Norris Cancer Hospital, one of only a few Southern California facilities exclusively dedicated to cancer research and care. It was there in early September she began treatments under the watchful eyes of Keck School of Medicine of USC faculty oncologists. Hodgkin’s lymphoma is a type of blood cancer originating from white blood cells known as lymphocytes. While its cause is unknown, Hodgkin’s lymphoma is thankfully considered one of the most curable forms of cancer when detected early enough in its progression. Patients can be effectively treated with radiation therapy or chemotherapy, and because five-year survival rates exceed 90 percent, many young patients often live 40 or more years after treatment. Regardless of the relatively optimistic prognosis, nobody expects or wants cancer. Roach also exemplified the spirit of occupational therapy in the way she chose to continue living life to its fullest rather than retreating into her diagnosis. As health care providers, occupational therapists provide clinical interventions designed to help their patients perform meaningful activities, no matter the obstacles posed by extenuating health conditions or life circumstances. For Roach, that outlook meant she would not be taking a leave of absence. Throughout the fall 2012 semester she continued to keep pace with course lectures and assignments while also undergoing treatment. Roach also has a second family — the USC Trojan Family — that would soon be supporting her. In late November, those caring classmates rallied around their friend and colleague. Because hair loss is perhaps the most obvious side effect of cancer treatments, Roach decided to just go ahead with shaving her hair, and began wearing a decorated scarf on her head. In a touching display of solidarity, the entire second-year master’s class organized “Scarf and Hat Day” in response. Over 100 students arrived at school wearing some form of headdress, from beanies to ball caps. Together they posed for a group picture at the Harry and Celesta Pappas Quad in the heart of the Health Sciences Campus. Front and center was Roach, flexing her biceps and smiling widely. 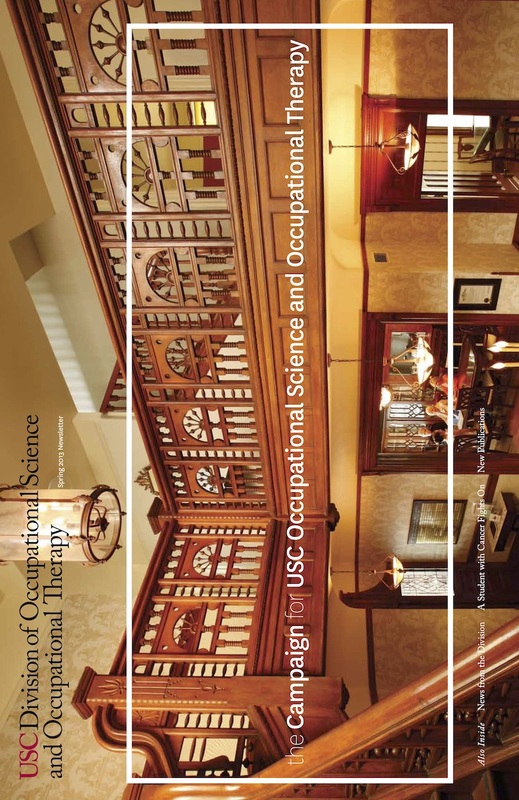 According to Roach, that emotional support was not only a gesture to her but a broader reflection of the empathy at the heart of USC occupational therapists, present and future. In January, with treatment well underway, Roach successfully walked the Tinker Bell Half Marathon at Disneyland Resort in Anaheim, CA. With the help of Team In Training, a fundraising program of The Leukemia & Lymphoma Society, she used her walk as an opportunity to raise money for improving leukemia, lymphoma, Hodgkin’s disease, and myeloma treatments. Not only did she finish the race, her 10th half-marathon and first with cancer, she was also the top fundraiser in the entire nation, raising over $11,000. On March 8, Roach finished her last scheduled treatment. With more surveillance testing ahead of her, she is technically not yet in remission. But she is already looking forward to ways of leveraging her experience to benefit others in need. 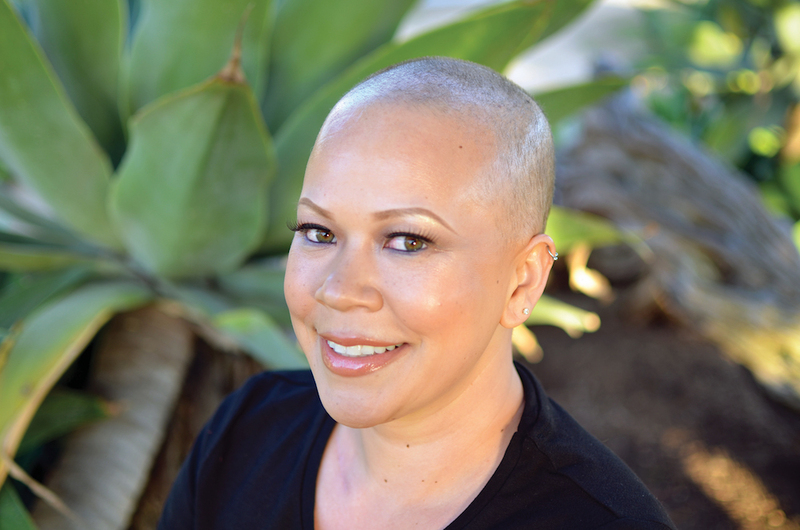 Roach also recently decided to pursue her Doctorate of Occupational Therapy degree, accepting a clinical residency position at the Keck Medical Center of USC with the hopes of working one-on-one with people with cancer. “I don’t think a lot of people are getting occupational therapy, who have cancer. This is somewhere I can give my input, and it means something. I am here. I’m living it right now,” she says with an unmistakable air of gratitude.